Here is the link to Mr. Bump on Amazon. From there, you can scan all sorts of Misters. What books have saved your sanity during a family vacation? I'm always looking to add more selections to our collection. I always bring along the 20th Century Children's Book Treasury. This is a huge collection of picture books for children of all ages. There are simple, quick easy reads (i.e. Goodnight Gorilla, Freight Train) to more lengthy stories such as A Chair for My Mother. When we are not traveling, it rides in the car for those moments where we have a few minutes to fill up while waiting. 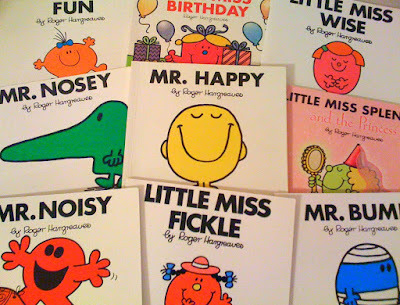 I used to love these books! I have fond memories of going to the bookstore and picking out a stack of books for our travels...then being sad when we got home and my mom hid them until we actually got in the car! We are trying to instill this love for books in my kids! I have seen those books and thought it looks really interesting but never pick them up. Now I will have to check them out. Thanks! I've also brought the 20th Century Children's collection or other anthologies. On road trips I often just bring big bag of library books. The Berenstein bears go on vacation is a particular favorite. Some cheap paperback books from Scholastic Book order or fiction about the place you're traveling to would also be awesome.